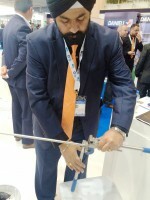 SANDVIK says demonstrations of tube bending will be on its stand at Tube 2016 which will be used to show the versatility and how the controlled hardness of Sandvik tube sets a standard of its own for easy bending and leak free connections of the company’s hydraulic and instrumentation tubing. “We are sure the demonstrations and the fact that people can have a go at bending the tube themselves will raise awareness of the quality of our products as well as show the marked difference in weight and strength between material grades,” explained Haydn Eagle, regional sales manager EMEA, Tube. “The exhibition provides us with an ideal platform to invite visitors to discuss any corrosion issues they are looking to resolve and in response explain how our products can help solve these issues”.